Congratulations to all local government, fire service and voluntary sector staff recognised in this year’s Queen’s Birthday Honours List. 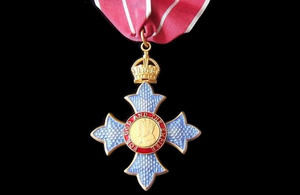 I would like congratulate all those from local government, the fire service and voluntary sector on receiving an award in the Queen’s Birthday 2012 Honours List. This is a fantastic achievement and great recognition of all their hard work and dedication to the community. Well done and thank you! James Carlson receives an OBE for services to Combating Homelessness.